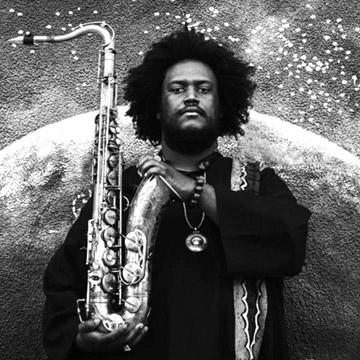 Tenor saxophonist Kamasi Washington released his new album Heaven and Earth last summer to worldwide acclaim. When Kamasi Washington released his tour de force LP, The Epic, in 2015, it instantly set him on a path as our generation’s torchbearer for progressive, improvisational music that would open the door for young audiences to experience music unlike anything they had heard before. The 172-minute odyssey featuring his 10-piece band, The Next Step, was littered with elements of hip-hop, classical and R&B music, all major influences on the young saxophonist and bandleader, who exceeds any notions of what “jazz” music is. Released to critical acclaim, The Epic won numerous “best of” awards, including the inaugural American Music Prize and the Gilles Peterson Worldwide album of the year. Washington followed that work with collaborations with other influential artists such as Kendrick Lamar, John Legend, Run the Jewels, Ibeyi and the creation of “Harmony of Difference,” a standalone multimedia installation during the prestigious 2017 Biennial at the Whitney Museum of American Art in New York City. His mass appeal continues to grow drawing vibrant, multi-ethnic and multi-generational crowds with tour stops at the world’s most prominent festivals such as Coachella, Glastonbury, Fuji Rock, Bonnaroo and Primavera.